MASSPORT WAS AWARDED $800,000 TO REPLACE 26 DRAYAGE TRUCKS: The vehicles service the Conley shipping terminal in Boston and distribution centers throughout eastern New England.MASSPORT WAS AWARDED $800,000 TO REPLACE 26 DRAYAGE TRUCKS: The vehicles service the Conley shipping terminal in Boston and distribution centers throughout eastern New England. DERA funding will assist in marine vessel repowering and vehicle replacement projects. In 2016, EPA awarded $1.4 million from DERA to the six New England states. EPA makes awards to states to support efforts to reduce diesel pollution. Three New England projects have been awarded nearly two million dollars under a competitive national grant competition to reduce diesel emissions. The grants, totaling $1,975,000, were made under the Diesel Emissions Reduction Act (DERA). The funding will assist the Connecticut Maritime Foundation, the Massachusetts Port Authority, and the Massachusetts Bay Transportation Authority in marine vessel repowering and vehicle replacement projects. The Connecticut Maritime Foundation, in partnership with Cross Sound Ferry Services, Inc., has been awarded $800,000 to repower two propulsion and four auxiliary engines on two marine ferries. This project is expected to reduce annual nitrogen oxides (NOx), particulate matter (PM) and carbon dioxide equivalent (CO2-e) emissions by an estimated 29 tons, 1.34 tons and 3,331 tons, respectively, in addition to conserving fuel. “This project advances the environmental improvement goals for our fleet of vessels, an effort which began almost ten years ago by deploying new, efficient, low emission engines to improve air quality locally and throughout the region,” said John P. Wronowski, owner and president of Cross Sound Ferry Services, Inc. 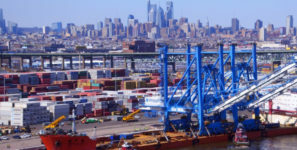 The Massachusetts Port Authority has been awarded $800,000 to replace 26 drayage trucks that service the Conley shipping terminal in Boston and distribution centers throughout eastern New England. Once completed, the project is expected to reduce annual nitrogen oxides, particulate matter and carbon dioxide emissions by an estimated 12.5 tons, 0.99 tons and 72.2 tons, respectively, in addition to conserving fuel. The Massachusetts Bay Transportation Authority has been awarded $375,000 to replace five service vehicles with newer vehicles built to current air pollution emissions standards. Once completed, the project is expected to reduce annual nitrogen oxides, particulate matter and carbon dioxide equivalent emissions by an estimated 0.35 tons, 0.03 tons and 65.9 tons, respectively, in addition to conserving fuel. Since 2000, the MBTA has launched a series of projects designed to reduce energy consumption and provide cost savings. “This DERA grant will help the MBTA work towards reducing our energy consumption and upgrading our fleet to the cleanest vehicles available in partnership with EPA,” said MBTA Acting General Manager, Brian Shortsleeve. The awards will cover 25 percent of project costs for vehicle replacements and 40 percent for ferry engine repowers. Grant recipients will cover the remainder of the costs needed to complete these projects. These New England projects are part of nearly $28 million in grant funds awarded by EPA nationwide for clean diesel projects in 2016. In addition to the competitive grants program, in 2016, EPA also awarded through DERA a total of approximately $1.4 million to the six New England states to support their state efforts to reduce diesel pollution.